Miss Five has had her heart set on a cheetah print playsuit for a while now. She fell in love with a silk swatch I ordered a while back and I convinced her that it would suit a little playsuit. The idea of her in cheetah print kind of appeals to me. But because I was drafting this pattern myself, I thought I’d test it out with scraps first. The bodice is made using some beautiful Art Gallery scraps from my Carolyn Pyjamas and wrap pants. I had such a small amount of this left that both the front and back bodice pieces have centre seams. It’s not ideal, but you can hardly notice with the busy print. 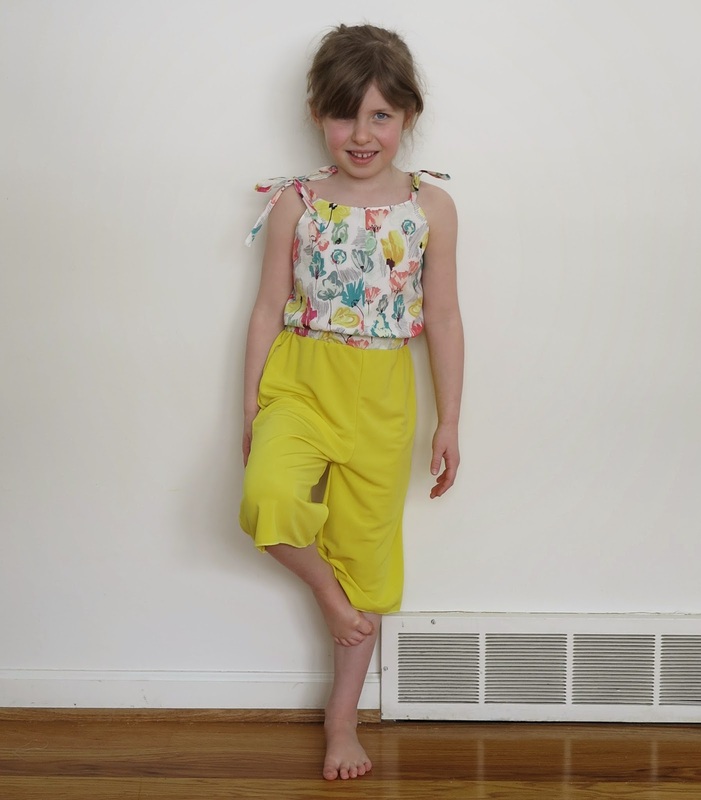 The pants are refashioned from my long yellow kimono jacket. When cutting the pattern pieces, I positioned them along the side seams to preserve the pockets for the playsuit pants. 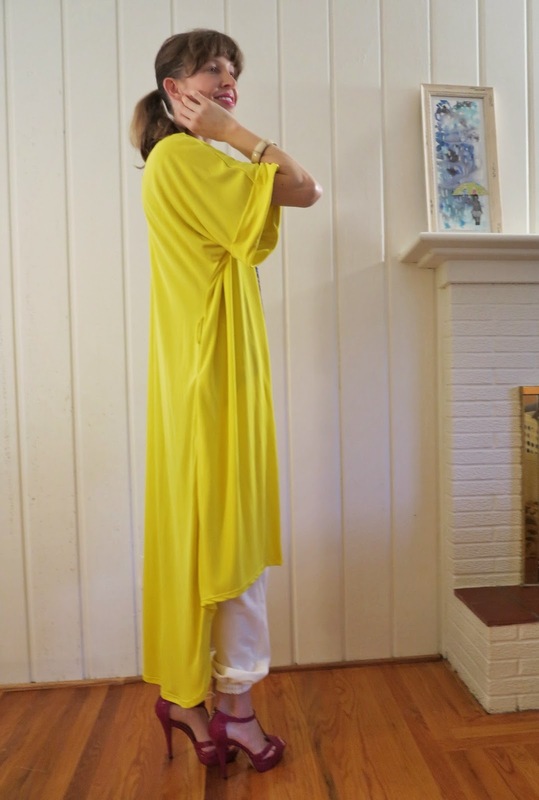 The kimono rayon is heavy and drapey, but those pants would work just as well in another type of knit or even a woven fabric. 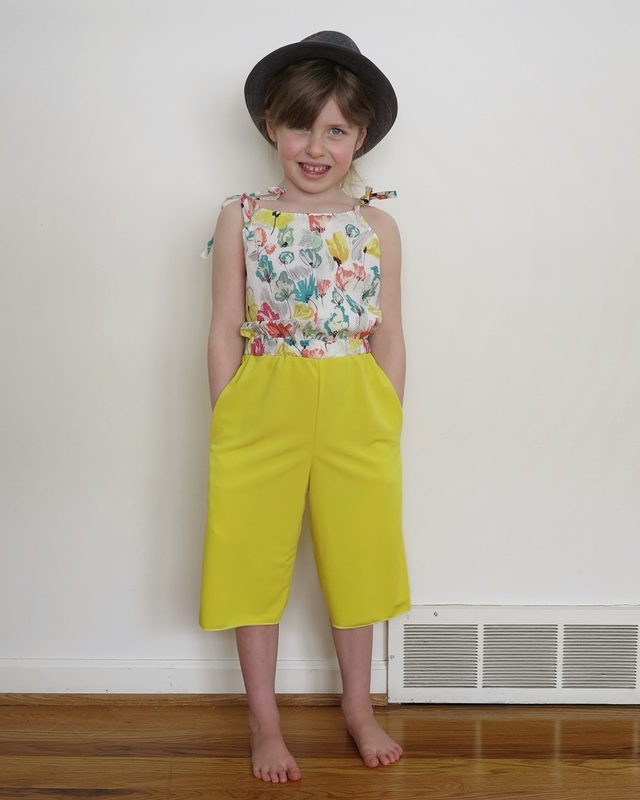 Gaucho pants and culottes are so hot right now and I love being able to translate this trend into some cool kiddie clothes. 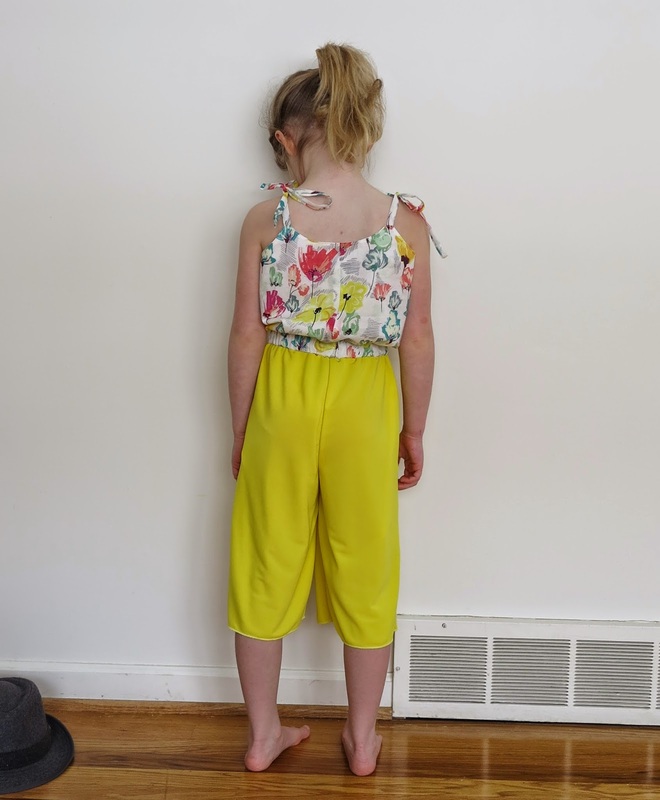 Miss Five fell instantly in love with this little playsuit and I can see her getting loads of wear out of it in summer. It’s comfortable, cute, and most importantly, she can get it on and off without too much bother. 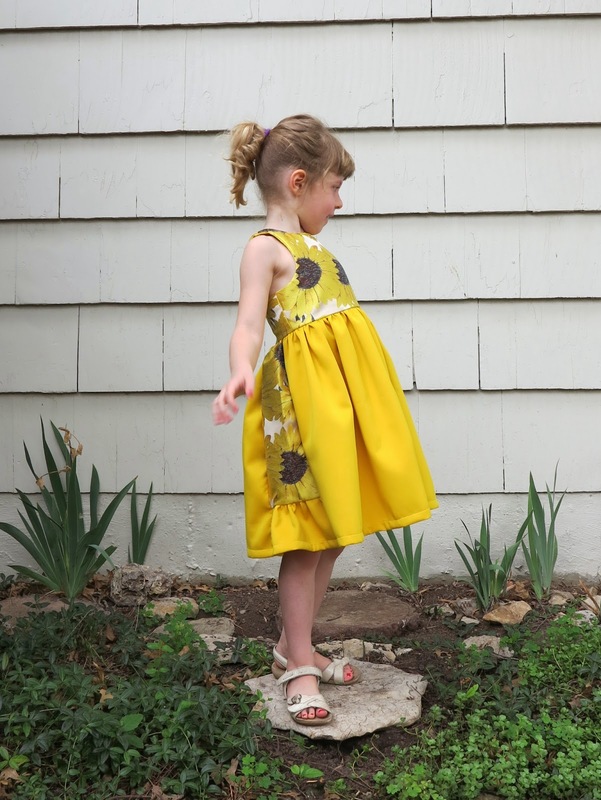 This entry was posted in Art Gallery Fabrics, cotton, Mood, playsuit, rayon, refashioning, self-drafted, voile, yellow on February 24, 2015 by Debbie Iles. You’ve seen a slightly different version of this dress before. I wasn’t happy with it and although I meant to walk away, I simply couldn’t stay away for long. There was too much about the original version that I did like. It had potential. Unrealised potential. So what did I do to improve on the original? 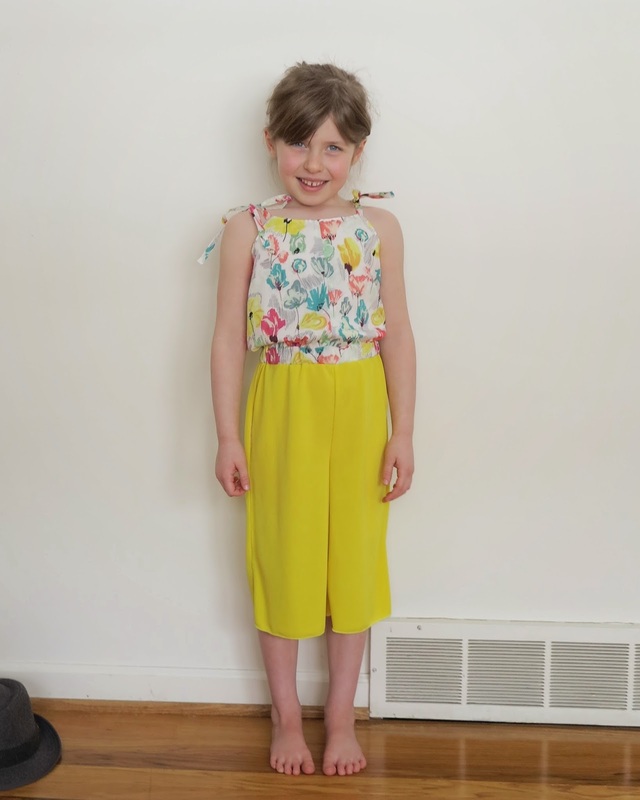 I cut away the skirt, raised the bodice a little, changed the front bodice shape, and redrafted the skirt completely. I think I’ve come away with a much better dress. And have I said before how much I like yellow right now? Could it be that some of those yellow pineapples I keep seeing in blogland are finally rubbing off on me? 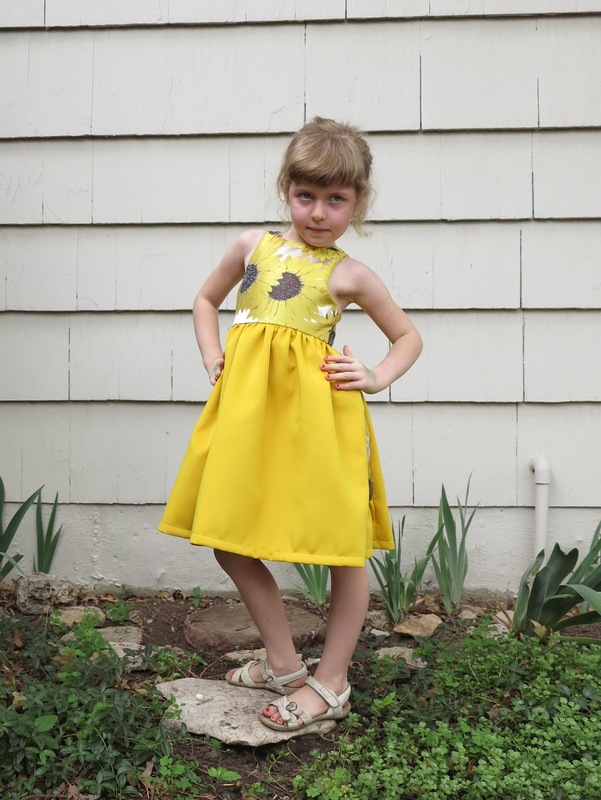 This entry was posted in cotton, dress, drop waist, Mood, sateen, self-drafted, yellow on February 7, 2015 by Debbie Iles. I’m going to put my hand up and say that this dress was not intended for my smallest peep. Not in the beginning anyway. 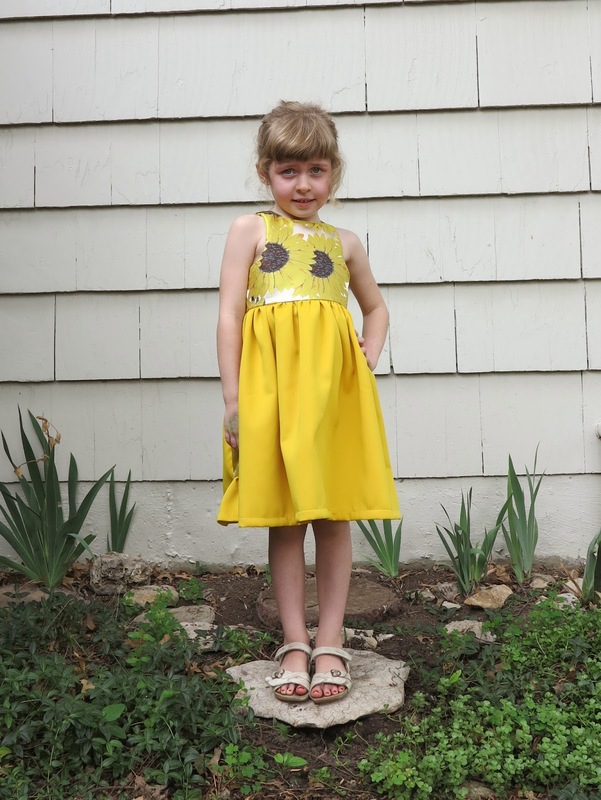 I knew I was treading a fine line to make the pattern (and small fabric remnants) fit Miss Four, but she was the one with her eye on the sunflowers and I was determined to give it a go, not just for her but for the sake of Oonapalooza. 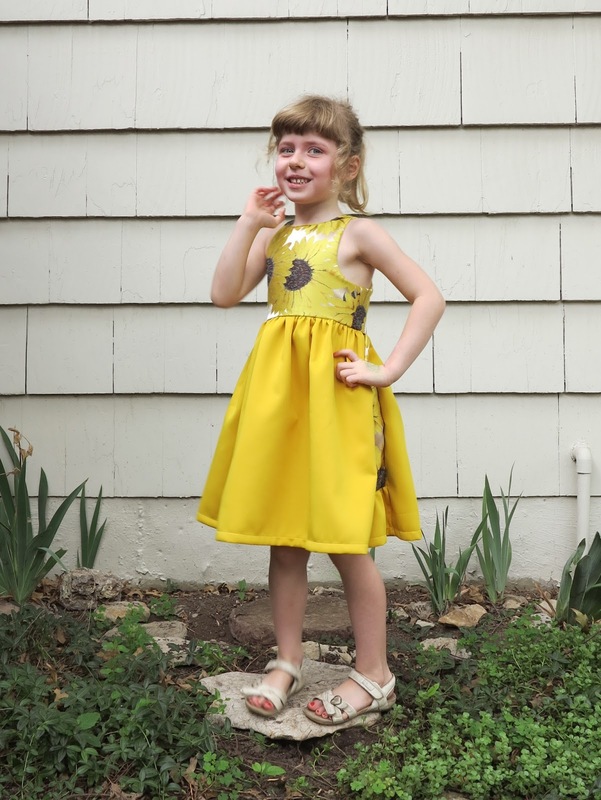 The good news is, the dress does fit Miss Four, but it’s a very tight squeeze, and most definitely, it will not fit her come Fall when the weather will be more suitable for wearing neoprene and polyester. We decided to wrap it up for Miss Two’s birthday in November. 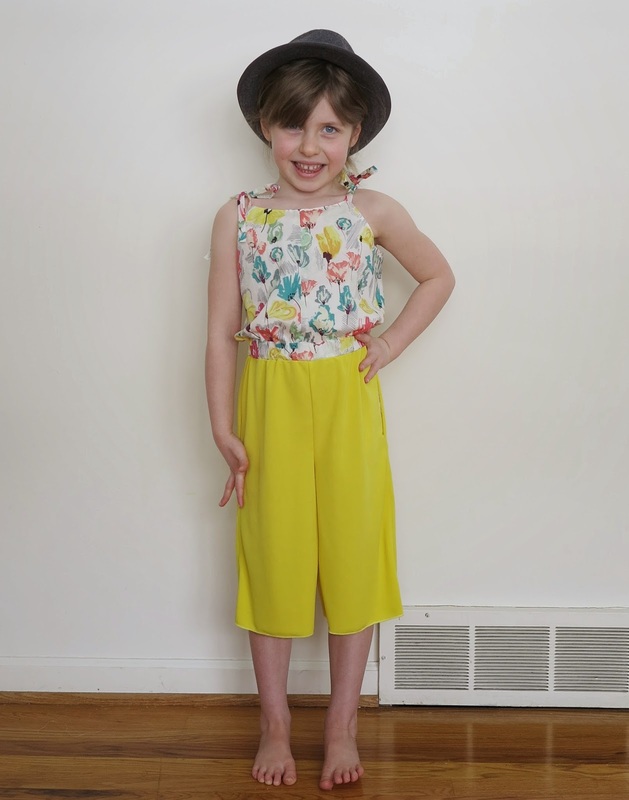 Miss Four was more than happy to pose for photos and give it a trial swish. She wanted to keep it for herself but was (surprisingly) able to see reason when she realised she couldn’t bend over to do up her shoes. As usual, when I’m sewing something for myself, there is at least one (if not three) little requests that get put to the seamstress. Miss Two usually just wants the same as me. The bigger girls are a lot more specific with their requests. Miss Four seems to think that I have the power to change the colours and shapes of prints on fabric. But for a change, she was quite enamoured with the sunflowers exactly as they were. It’s a shame it doesn’t fit her because it really is her kind of dress. There’s always next time. 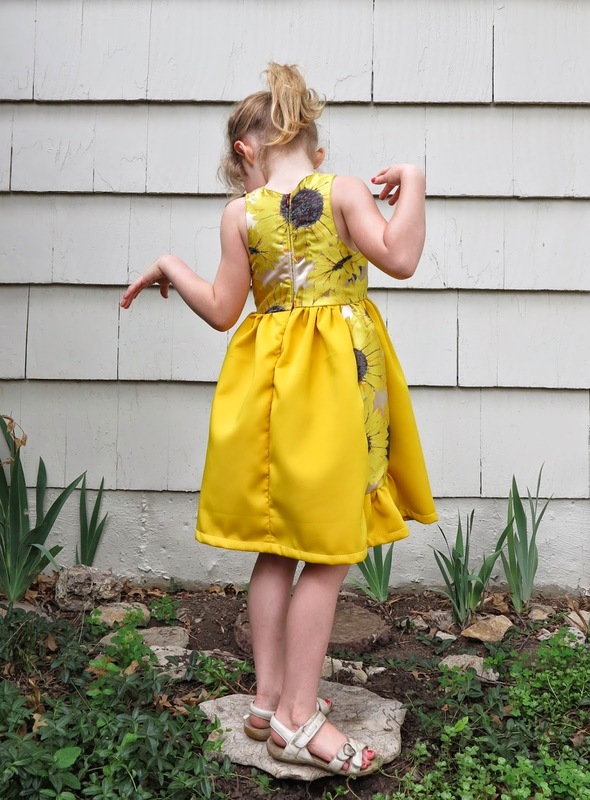 The dress pattern itself is self drafted. I’ve made it before here and another time before this. I should have tweaked the bodice lines a little before I sewed this one. I keep forgetting that I bound the armscye in the original version, instead of fully lining it as I did with this one. I just need to add a little extra to the seam allowances in the armscye. And I really need to start taking better notes when I sew things! 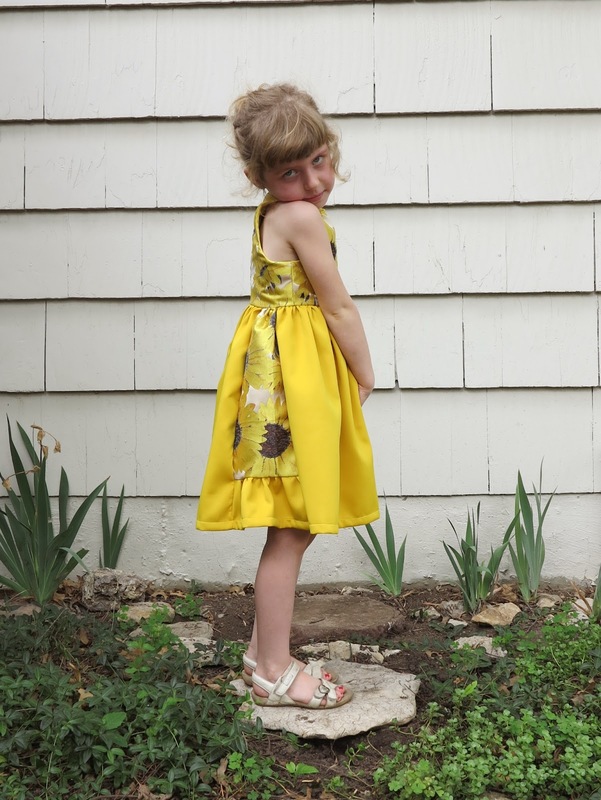 This entry was posted in dress, neoprene, polyester, Tessuti Fabrics, yellow on July 10, 2014 by Debbie Iles. B5409: Hello yellow kimono jacket! I’ve been inspired by a few ladies (here and here) on instagram recently. We live in worlds apart and adhere to vastly different dress codes, but I can’t help but admire how these ladies who choose to cover their hair and dress conservatively can look so individual, classically elegant, and fashionable, all the while having to adhere to much stricter fashion rules than I. One of the things I’ve noticed, is that these ladies know how to layer. And perhaps it is the ability to drape and layer with aplomb, that has drawn my interest more than anything else. And perhaps because of them, I am a little in love with fluid, unfitted, kimono jackets right now. Yes, I’m also smitten with white, and yellow, and big, long dramatic hems…and no doubt there will be another whim to enter my world of fanaticism next week. But today, it is the kimono. 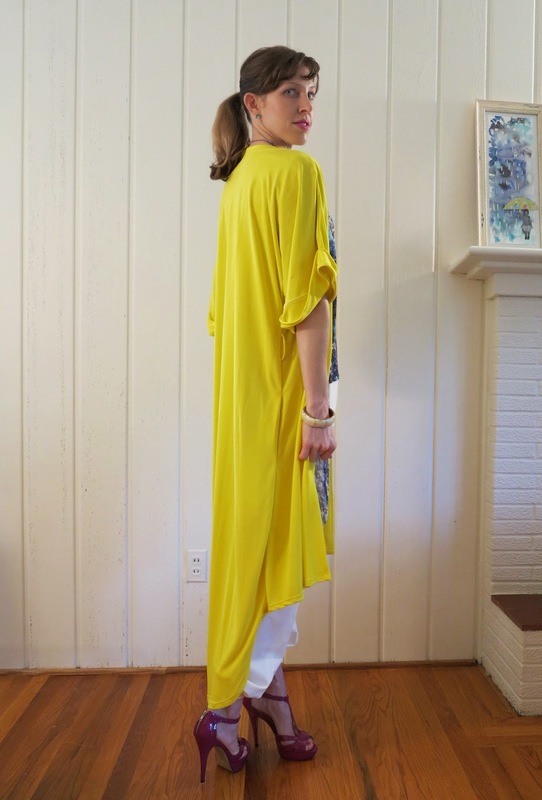 I would like to introduce you to my buttercup yellow kimono jacket. I love her! 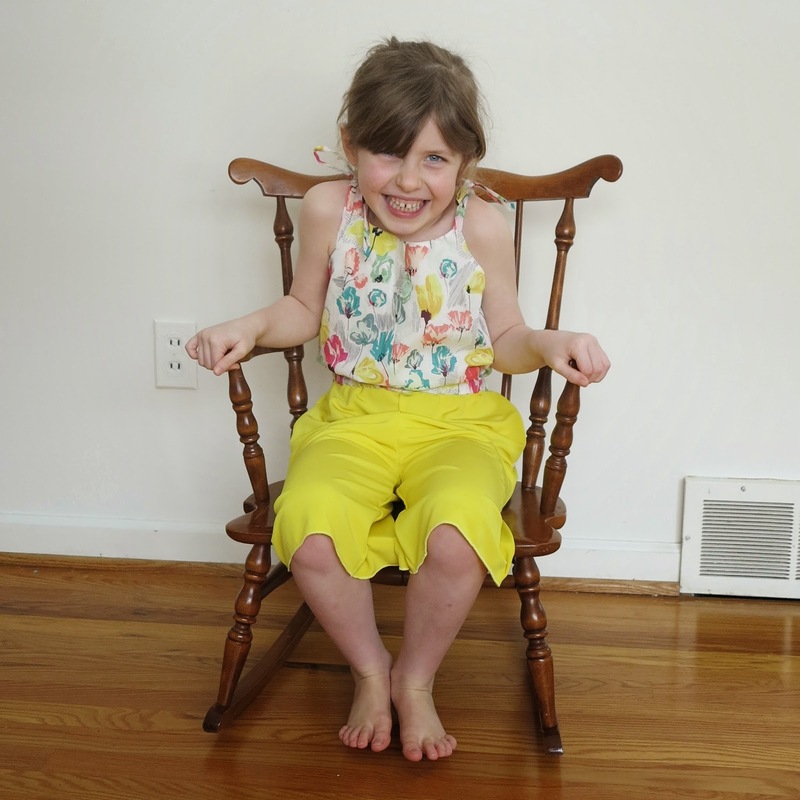 She is made from a beautiful, drapey, matt rayon jersey from MOOD. I cannot tell you how many yellow swatches I ordered before I settled on this one. And I did have to settle, since a remarkably more expensive 4-ply silk crepe de chine was my first choice! The jacket is a LOT heavier than it would be, had I sewn it in crepe de chine. It hangs and drapes fluidly, rather than floats. I’ve paired it with my fancy pant Ralphy tracky dacks and bad hair courtesy of night parties with two of my peeps. The pattern I started from is B5409. The ghastly pictures on the pattern cover give no indication of what can be done with this pattern. I purchased it in the larger size because I’d originally intended on sewing it in a woven, despite the pattern calling for a knit. Usually, I would sew a size down from the one I chose. added belt loops in the side seams (just above the pockets). Again, these are also too low, although I don’t think I will be using them anyway. I was only intending to tie a belt through the back of the jacket, not around the front, and I don’t think it needs this after all. ditched the collar and drafted the missing bit of facing. Because of the floppy nature of the fabric, even with interfacing, I stitched all the facing down, from neck to toe. sewed the cuffs on the opposite way so that I could fold them up. Tacked them in place. 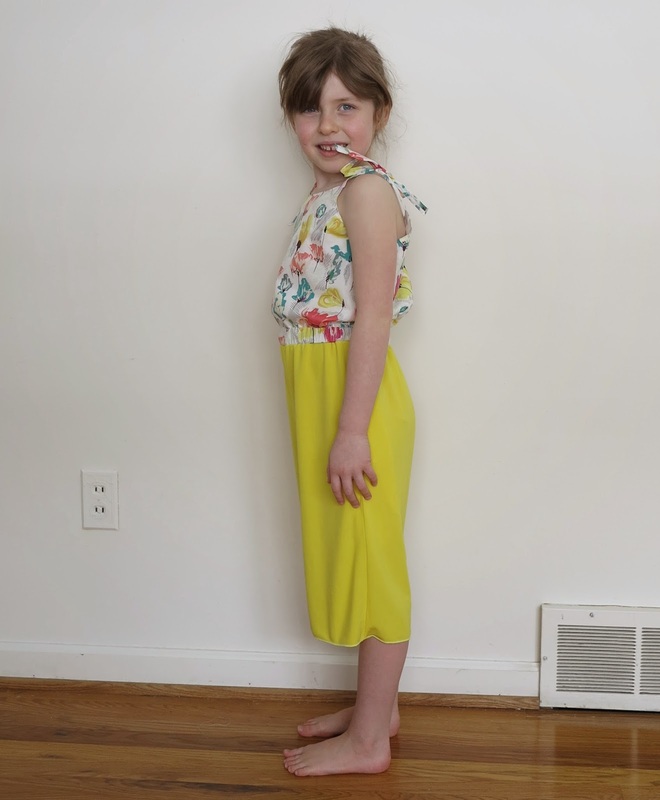 lengthened the front and back significantly and created a graduated hemline. I’m really pleased with how it turned out. I will definitely be sewing this jacket again. Next time though, I will skip the belt loops and bring the pockets up a bit higher. I’m thinking I might put in a fabric order for my upcoming birthday to make this in a bright and boisterous printed crepe de chine. What do you think? 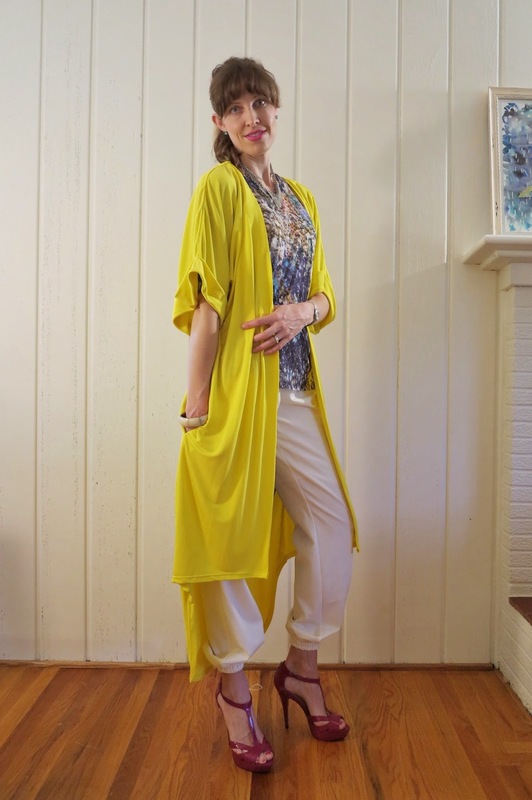 This entry was posted in B5409, jersey, kimono, Mood, pants, Ralph Lauren, rayon, wool, yellow on June 8, 2014 by Debbie Iles.